Oh.my.gosh. you guys, we literally CANNOT contain ourselves! Jaclyn Hill & Morphe have collaborated AGAIN but this time to create what is possibly one of the most hyped eyeshadow palettes of 2017! Feast your eyes on The Jaclyn Hill Palette – try not to like, pass out. This beauty took two years to develop and it’s being released Wednesday 6.21! It features an astonishing 35 shades (for only $38, like whatttt?!) There is alottttttttttt to take in so buckle up! We’re taking you through it ALL! 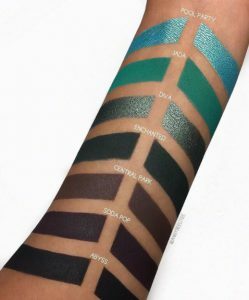 First, we have to talk formulation – these shadows in here are not your average Morphe shadow. Jaclyn literally REQUIRED that this palette feature shades with completely revamped pigmentation, texture & blendability. This is HUGE. 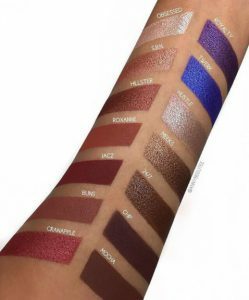 She even went as far as to specify the amount of pressing each shadow should have to give it the best texture & application with the least fall out – saying Jaclyn was insanely involved in the creation of this is a massive understatement. I mean, the quality of Morphe shadows, in my opinion, was already quite dope. These are likely to knock your false lashes off with their WOW factor. WE CAN’T WAIT to touch these and put them all over our face. Now for the shades – this is where ish gets SO REAL. There is literally no limit to the number of looks you can create with this piece of art. We have an ample array of warm tones (duh), plenty of cool tones, plus neutral everyday shades and fabulous pops of color! The finishes range from matte to satin to shimmery to metallic to duo-chrome – there’s not a finish you won’t find here! Each type of shadow applies super creamy – some reviews have even mentioned that the level of silkiness is to a point that some feel actually wet. Ummmmm…. uhhhhh?! Magical. 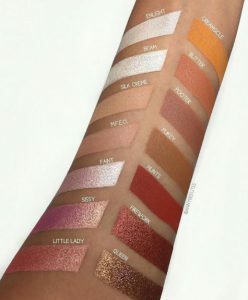 Unlike most Morphe eyeshadow palettes, the shades in this one have names! Eeeeep, we LOVE that! Unfortunately, the shade names are not printed on the packaging itself, but it does comes with a insert that includes all of that info (just try not to lose it!). The variety here really cannot be beat. Sure, most of the shades are ones that we’ve seen before but NOT LIKE THIS! This is your new all-in-one, go-to-for-every-look palette. From simple looks for the office, to deep sultry date night looks, to formal, classy prom looks and that super fun, summer-loving bold colorful look, this is it. Everything. Right here. With this formula quality, fabulous packaging, assortment of shades and affordability (did we mentioned 35 shades for $38?! ), you basically can’t NOT get it. You know?! Plus, for all the hard work Jaclyn put into this, we gotta show our girl some love! Check out her video & a bunch more below to witness the magic for yourself! it’s going to change the game, I cannot wait! This looks gorgeous! I really want one, but I just know it’ll be so hard to get hold of! if you put your mind to it, you can totally get it! Just be ready when it drops! How come?! You just have to be ready ASAP when it goes up on the site! You can do it! Wow. I’m so impressed with the colors and pigmentation. I NEED to get my hands on this!! Then you literally have to be at the ready the SECOND it launches – it’s totally going to sell out literally in minutes! You can do it! in 2 days! On the 21st at 8AM! Set your alarm, girl! 8 am PST/ 11 am EST! Omg right?? Did you grab it today?? Anyone know where it’s made??? USA or CHINA?